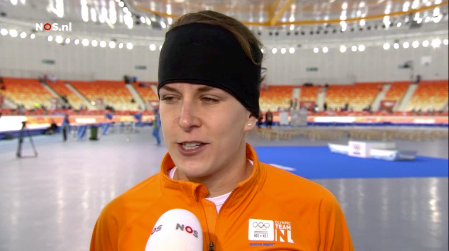 There’s a worldwide appreciation of the Dutch Olympians and their achievements during the Sotjsi Olympics. They’ve won an incredible amount of medals and so you might expect them to be happy at the least. And of course most of them are, especially those who won an unexpected or a gold medal. However there is also much drama. Jan Smeekens thought himself an Olympian champion for 20 seconds until the officials corrected the time of his closest opponent and awarded Michel Mulder with the gold medal. Or watch Koen Verweij who missed the gold medal by 0.003 seconds, an estimated 3,5 cm on a 1500m run. These and other drama’s provide beautiful nonverbal reactions during the interviews for Dutch televisions. I’ve analyzed a few of them and share my insights with you. Not a face of a person enjoying something, is it? No, this expression we usually associate with feelings of disgust, or deep frustration. And those feelings would be more fitting to the occasion, I think. Who does she feel, according to you? Amused? Happy? Certainly not; the clenched teeth suggest at least feelings somewhere in the range from pain to disappointment, or regret. This is how the dead certain candidate for gold on the women’s mile speed skating looks like when she says she respects the achievement of her opponent who won ‘her’ gold medal. To me she looks like someone who very much wants to set things straight, maybe even with a little vengeance. Not a person who feels respectful towards anything or anyone. And also in this case feelings of vengeance would be more fitting to the occasion. But again, that’s not what she’s saying. Off course she know that facial expressions mirror our feelings. But it also works the other way around: to mimic a certain expression evokes the matching feelings. If you feel sad end you put a smile on your face you feel a little better. If we allow our face to form a slightly sad expression when we feel deeply hurt for instance, it would be very hard to keep ourselves from crying. So we try to control our expression to avoid a public show of deep emotions. People use that mechanism when they try to suppress certain expressions of strong feelings. He starts out struggling to keep his mouth in a neutral expression. During the interview he has to work harder in harder to keep things in check. After a minute he needs his tongue and hands to suppres the strong emotions of disappointment and perhaps anger. But as a true Olympic champions he succeeds. As an executive and mental coach I’ve learned that the friction between experienced and (socially) preferred feelings is an excellent lever for enduring improvement. So I always observe my clients closely; not a difficult thing for me, since I’m fascinated by things as emotions, drives and performance improvement. These wonderful athletes do not only provide beautiful sports experiences, they are also great learning material.